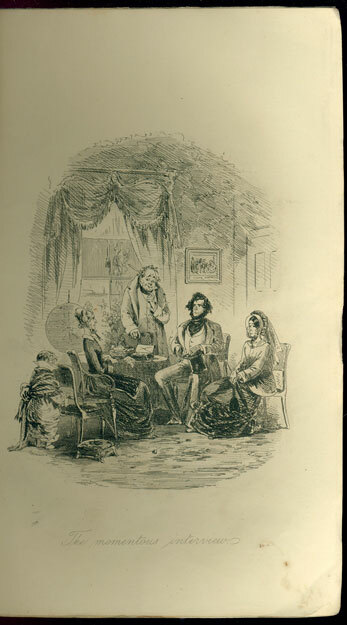 Dickens' eighth novel was published in monthly parts in London by Bradbury & Evans, May 1849-1850, and also appeared in one volume in 1850. 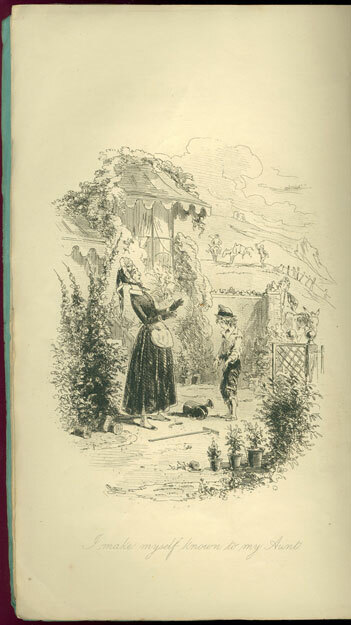 Dickens' principal illustrator, H.K. Browne, provided the images. This was a widespread method for presentation of the novels of Dickens and other Victorian authors. There were advantages for writers: the novel need not be complete before publication began; a writer could be at work on more than one story at a time. For publishers, the monthly installments, which were stitched into printed paper wrappers, provided steady income, as readers eagerly awaited and purchased each part, impatient to find out what would happen next. 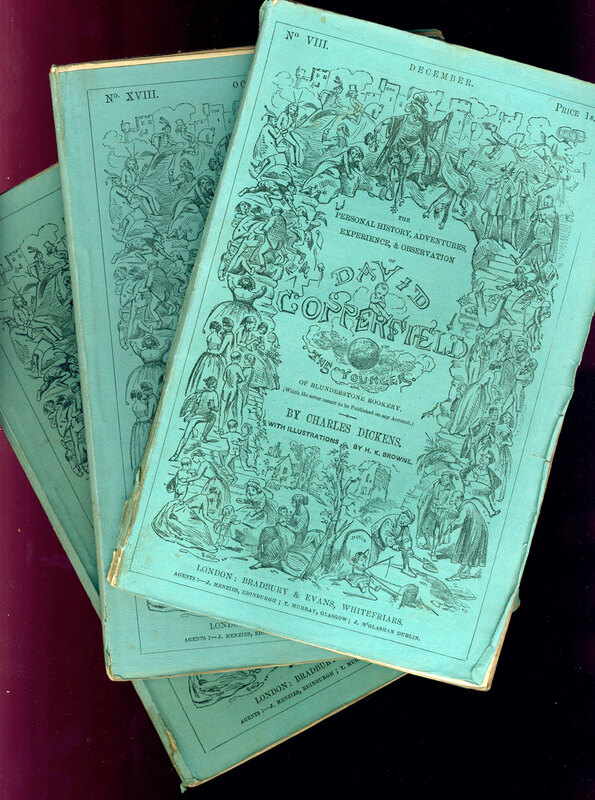 The parts were stitched into a paper wrappers (usually blue or green), printed with vignettes illustrating various characters and scenes in the novel. The serial title was generally much longer than the title used in later editions. This one begins The Personal History ... , not simply David Copperfield. The illustrative plates (generally 2 or 3) are included together just before the start of the text. If the parts were later bound in one volume, the illustrations would be placed at the appropriate place in the text. The paging is continuous from part to part, so that when the parts were later bound in one volume, the numbering would be correct. 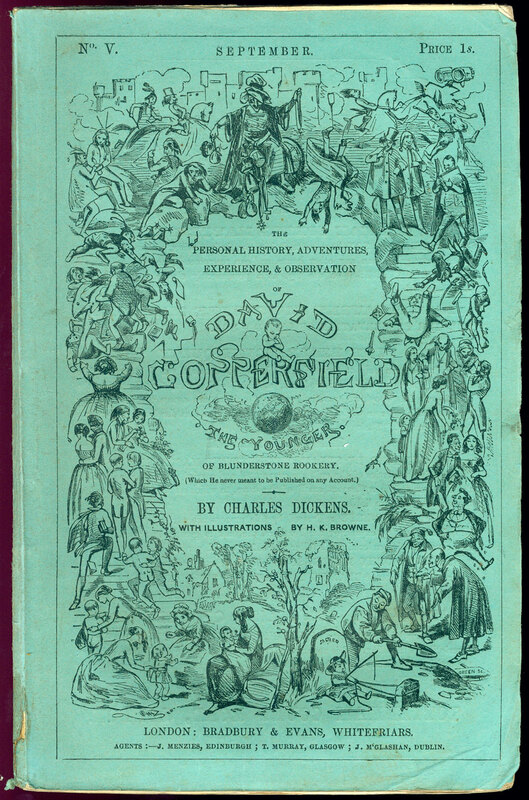 Advertisements were printed on the wrappers of each installment, as well as on a number of pages preceding and following each segment of the novel. Products advertised included: books, clothing, household goods (silverware, bedding, umbrellas, etc. 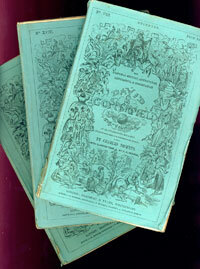 ), and medical cures, pills, and ointments. Often a 24- or 32-page bookseller's catalogue would be stitched in at the end of a monthly issue of a novel. For the modern reader, these advertisements put the books in their social context and tell us about the audience for whom these novels were intended. Alas for book collectors, librarians, and scholars, for when monthly parts were bound together as one volume, the advertising and printed wrappers usually were discarded, and a significant part of the history of these works was lost.